Hikmet from Berlin’s Solebox empire goes back a long, long way with us at Crooked and he puts out a lot of collaborations. A lot of those dual-label projects are very, very good. In the time it took for you to read that opening, he has formulated another five projects. With Saucony, there’s been a Jazz, Solebox Shadow 90, a few homages to the “dipped” colour of Solebox NB collabs from close to a decade ago (we’re feeling old right now) and the ‘Three Brothers’ pack from 2011 that broke out the blues. Now they’ve gone all fraternal again with their Three Brothers concept again — one shoe in a trio of different base colours. Released in December in quantities that had some German kids sleeping rough on those cold streets, they’re letting the purple part of the pack go global this weekend to a handful of retailers. The Saucony Shadow 5000 is a shoe with a Crufts level pedigree — introduced in 1989, it delivered flex, support and cushioning for high mileage runners in an accessible and neutral package. That model put in some miles, but it was 1991’s Shadow 6000 that really went the distance (we believe it was built on the 5000 last) and still has a dedicated running following (like the New Balance 998) over two decades down the line. We remember seeing the Shadow in spots like Rivington Club ten years ago, where it was in the mix alongside some proto hype pieces. We miss the days when staples could be subtly dropped in with the bigger name bits — retail lacks nuances in 2013. But back then, Saucony’s lifestyle offerings were a stop-start affair that wasn’t quite there. Now, the brand that took running ultra seriously and pushed things forward to a take a profitable share of the market has a lot of credible tech runners with history in the vaults. And guess what? People are hungry for the technical releases from before that dark period when it wasn’t cool to make a running shoe look nice. It’s good to see Saucony making moves at the moment and over 5 years into their collaborative friendship, Boston and Berlin have lots of common ground. Hitting that purple drank, the team have given this silhouette some greys and purples (which they also applied to another legendary runner that fought the Shadow 5000 for sales and shelf space — the ASICS Gel Lyte III), with an interesting colour block that greys out the lace stays to give it a very different appearance. The tonal trio of dots, leather lining and treacle-like outsole gumminess is all very well executed too. We maintain that Europeans do runners better than any other collaborator because it’s just part of the local uniform. 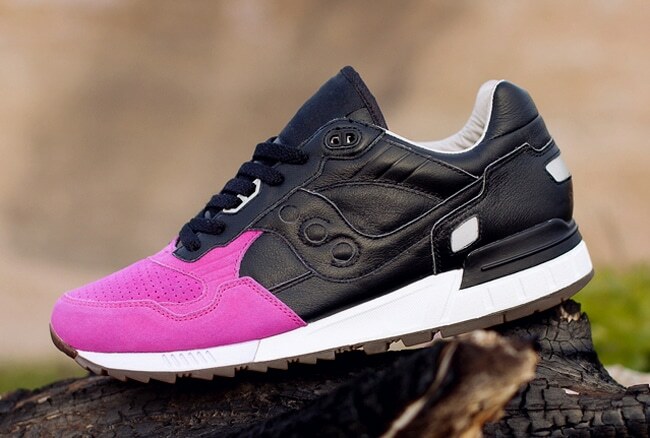 Solebox have a lot of experience remaking silhouettes like this and they’ve wisely let the purple reign.